When I lived in Lawrence, Kansas, there was this little Thai joint that had the BEST pad thai. A totally unique spot, Thai Siam is in an old Subway location — with the bright yellow tabletops and all. And although they’re not exactly known for having your carryout order to you on time, it’s well worth the wait. Their pad thai is some of the best I’ve ever had. And something that I know I have to have whenever I’m in the area. Especially since I’ve never quite found pad thai here in Kansas City that comes close to Thai Siam’s. So, I started making my own at home. I had pretty dang good results with this Cook’s Illustrated recipe, but wanted to make not only a gluten-free version — but also a Paleo version. After months and months of trying, I finally settled on a recipe that I think is good enough to share — and one that I make at least a couple times a month. 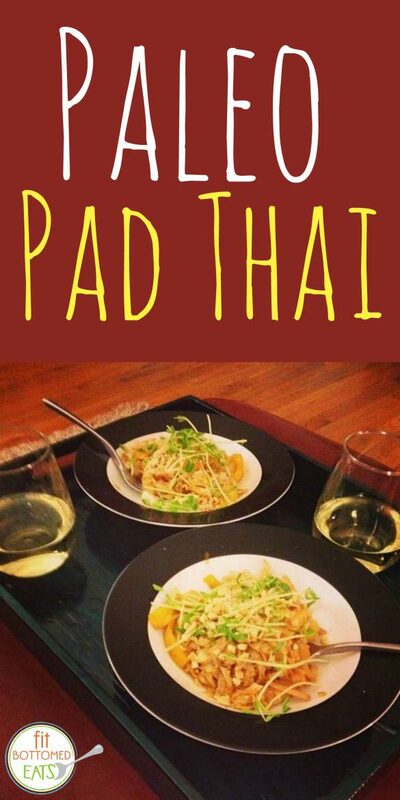 Behold … my Paleo Pad Thai recipe! The Paleo secret to this recipe is that it uses sauteed cabbage instead of noodles. It sounds weird and maybe not even that tasty, I know, but I promise it’s delicious — and super quick and easy to make! This Paleo Pad Thai uses cabbage as noodles and swaps out coconut aminos for soy sauce. Super tasty and super quick to make! Sprinkle white fish with salt and pepper. Cook over medium heat in a large pan until opaque and easily flaked with a fork. Meanwhile, in a wok or large sautee pan, cook red bell pepper over medium-high heat for two minutes. Add in cabbage and cook until wilted. Mix together coconut aminos, vinegar, fish sauce and sriracha. Poor over bell peppers and cabbage and mix until evenly coated. Divide cabbage mixture into four to six bowls (depending on how hungry you are) and top with fish, then cilantro, sprouts and peanuts. Enjoy!